As I mentioned in my very first blog post, I left Australia to go backpacking in May 1998. A few short weeks later, ARIA stopped producing the printed chart, with the last one dated June 7, 1998. Coincidence? Obviously I wasn't the only one obsessively collecting the top 50 printouts each week, because a couple of months later, the ARIA chart returned (due to popular demand?) to record stores like Sanity - although not Brashs, where I used to work casually during university, because that chain had also closed earlier in the year. And so I thought it might be fun to mix things up and venture back 20 years to that "final" chart to see what songs were in the top 50 for the momentous occasion - the date of ARIA's most disastrous decision since they decided to scrap the collectable charts for a poster-size version in 1986. His hit version of "Cherish" was still in the top 30 after 16 weeks, but the Dutch rapper born Godwijn June Orlando Ray Rollocks (yes, really) thankfully had no such luck with this terrible remake of the Pia Zadora/Jermaine Jackson tune from 1984. Speaking of terrible remakes, this dreadful rendering of the Hot Chocolate tune from 1975 clearly had the blessing of frontman Errol Brown, whose vocals can be heard (in between all the "do ya, do ya"s) and who put in an appearance at the end of the music video. This was the British one-hit wonder's 32nd and final week in the top 50. Next up, a song spending the first of what would be a 33-week run inside the top 50 (including five weeks at number 1). Taken from the Nicolas Cage/Meg Ryan film, City Of Angels, "Iris" was the third biggest single of the year in Australia and easily the biggest thing Goo Goo Dolls ever released. The rock ballad probably would've reached number 1 in the US as well if it had been released there as a commercial single. Instead, it spent a record 18 straight weeks atop the airplay chart, and by the time the rules were changed at the end of the year to allow non-singles to feature in the Hot 100, the best it could manage was a number 9 placement. In the UK, where I was living by this time, "Iris" was never a hit, peaking at number 50 - and so it wasn't until I returned to Australia in 2000 that I began to appreciate just what a huge song it had been. Conversely, Peter Andre was by this point a much bigger deal in the UK, where he'd scored two number 1s, than at home. He managed one final top 50 hit with this Warren G and Coolio-featuring single from third album Time. There's a reason this only top 50 entry for Sam Turner sounded like a watered down "I'll Make Love To You" - it was written and produced by Nathan Morris from Boyz II Men, who'd signed the singer and provided backing vocals on the song. I always think this lead single from Madonna's first studio album in four years reached number 1 in Australia - again, blame the fact that I spent a lot of 1998 in the UK, where it did top the chart. Quite why it didn't do even better here is beyond me. Instead, "Frozen" had to settle for being her joint biggest hit (with "Bedtime Story", "Secret" and "Rain") since "Erotica". We'll see breakthrough hit "You Make Me Wanna..." in Part 2, but Usher's follow-up just couldn't get past number 44 as it re-entered the top 50 to spend a second week there. The 19-year-old would have a bit of a wait until he scored his second big hit, which wouldn't come until 2001. In the post-Jagged Little Pill era, every record company jumped on the rock chick bandwagon - and Marie Wilson was Warner Music Australia's big hope. But "Next Time" would be as good as it got for the Melbourne singer, who managed one more top 40 hit later in the year. Also peaking at number 21 was this third single from Janet Jackson's Velvet Rope, which was remixed from the album version by Teddy Riley and featured Blackstreet on guest vocals. I preferred one of the other remixes - a dance version by remixer of the moment Jason Nevins. Number 41 "La Primavera" by Sash! Speaking of dance music, German club act Sash! had still to really break through in Australia, landing another mid-table hit with a song that had been much bigger in Europe. In the UK, this lead single from second album Life Goes On reached number 3, a slight dip after three consecutive number 2 singles. Fun fact: "La Primavera" is Spanish for "Spring". The commercial peak of Regurgitator's career, "Polyester Girl" bounded up 10 places this week and would quickly find its way into the top 20 - the first and only time the genre-shifting Brisbane band would reach so high. In 2018, Scandipop fans eagerly await the return of Robin Carlsson with promised new music, but 20 years ago, she was just starting out on her career with fine Cheiron-produced numbers like this UK and US top 10 hit, which shockingly remains her most recent ARIA top 50 appearance. Like Regurgitator, Victorian band The Mavis's achieved their greatest chart success with a shiny pop track that wasn't really indicative of the rest of their output. And "Cry" was an even more pronounced exception to the rule, ending up the band's only top 50 single. Proof that all a song needs sometimes is a decent remix, a flop single from 1997 was turned into a UK chart-topper in 1998 thanks to the handywork of Norman Cook, who was soon to dominate the dance scene as Fatboy Slim. In Australia, "Brimful Of Asha" was a more modest success and the only hit for Cornershop. His remix of "It's Like That" had done phenomenally well - and was still selling plenty of copies - but Jason Nevins' remix of 1987 track "It's Tricky" didn't have quite the same impact. In 2006, the song was the subject of a lawsuit when The Knack sued Run-DMC for the use of "My Sharona" without permission. Proving they were more than just a novelty Eurodance act, Denmark's Aqua took a break from their string of campy pop tracks to go into serious mode with this ballad included on the soundtrack of Siliding Doors. The move paid off, going on to give Aqua a fourth (and final) top 10 hit. They'd scored what would be their only top 10 hit with 1997's Batman & Robin single, "The End Is The Beginning Is The End", but this lead single from fourth album Adore, which continued Smashing Pumpkins' embrace of more electronic sounds, just made the top 20. One of five songs on this chart to register over 20 weeks inside the top 50, this was Will Smith's second big solo success, following his chart-topping debut with "Men In Black". "Gettin' Jiggy Wit It" made extensive use of two key samples - the instrumental hook from Sister Sledge's "He's The Greatest Dancer" and a vocal line from "Sang And Dance" by The Bar-Kays. Four years after Australia finally awarded Public Enemy a top 50 single, the hip-hop group achieved a second and final hit with this title track from the Spike Lee film. Like "Gettin' Jiggy Wit It", "He Got Game" features prominent use of a sample, in this case from Buffalo Springfield's "For What It's Worth", with vocalist Stephen Stills appearing in the music video. The first song in the series had reached number 10 back in 1991, and this sequel to "The Unforgiven", which flipped the heavy-then-soft structure of the original, had gone one better when it was released as the second single from ReLoad. A third part would follow in a decade's time, appearing as a track on Death Magnetic. Although not released as an official single, "The Unforgiven III" still managing to register inside the top 50. Here's another song, like "Iris", that didn't qualify for the Billboard Hot 100 when it was released and was relegated to the airplay chart in the US instead. In Australia, Fastball's only local hit, which was inspired by real-life events, spent exactly half a year inside the top 50, and although it didn't quite reach the top 10, it sold enough to end up as one of 1998's 50 biggest sellers. Like the Metallica song, here's another entry with a link back to 1991, the year when "The Grease Megamix" had topped the ARIA chart. This EP, released to coincide with the 20th anniversary of the cinema release of Grease, included that PWL medley, two new remixes by Martian of "You're The One That I Want" and "Summer Nights", as well as the original versions of those two tunes. While this release might not have done so well, the re-released soundtrack did set up camp again inside the top 10 and even managed to get in another week at number 1. Their first two hits in Australia had both reached number 1, but this third smash from Aquarium hadn't been able to dislodge "It's Like That" and "Never Ever" (both of which we'll see on Part 2), spending five straight weeks stuck at number 3 behind those two chart-toppers. She'd just kicked off her Intimate And Live tour, which would turn out to be a major turning point in her career in Australia, but this third single from Kylie Minogue's Impossible Princess album couldn't quite manage to break into the top 20 despite bubbling just under for a couple of months. And so this post ends as it started - with a dodgy remake of an '80s tune by Pappa Bear. His take on the Kool & The Gang smash from 1985 was much better than the song we saw at number 50 and was working its way down the chart from its top 10 peak. 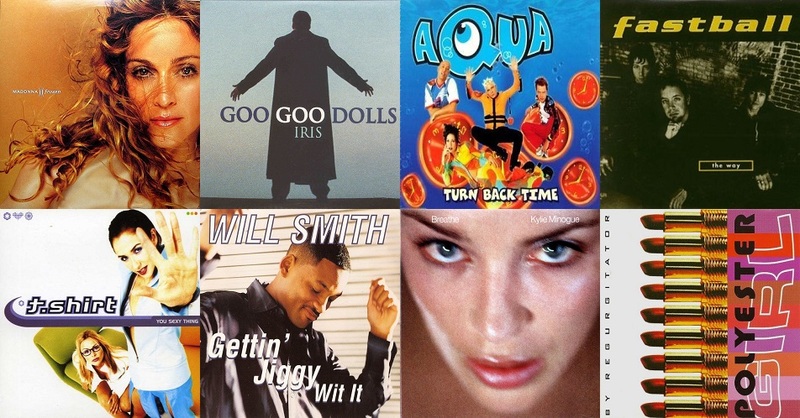 In Part 2: the top 25, including eight songs that reached number 1, some boy band and girl group greatness, and a couple of singles whose chart life was extended by some handy repackaging during their chart runs. It does seem odd in retrospect that, other than 'Vogue', no Madonna single released in the 90s peaked higher than #4 in Australia, especially considering how easily she debuted at #1 with a rather undeserving single in early 2000... 'Frozen' was something unexpected for Madonna at the time, even if that William Orbit sound became a bit overused on some of his later productions. The Goo Goo Dolls song was pretty inescapable in the last quarter of '98 here. But unlike similar songs, such as 'I Don't Wanna Miss a Thing', I actually liked 'Iris'; at least, initially. I don't really know how one Usher song goes, other than I don't like them. I liked the other Regurgitator singles from 'Unit', but find 'Polyester Girl' grating. So of course it became their biggest hit. I used to listen to Triple J a lot on my (cassette) walkman in '98, travelling to uni on the train and tram, before the station turned crap (IMO) in the second half of the year, under Richard Kingsmill's direction. 'Ava Adore' received heaps of airplay on the station, and it's one song that reminds me most of the year. "It's you that I adore, you will always be my whore" is a great opener. Though Billy Corgan does look a bit like a sickly cancer patient in the video.